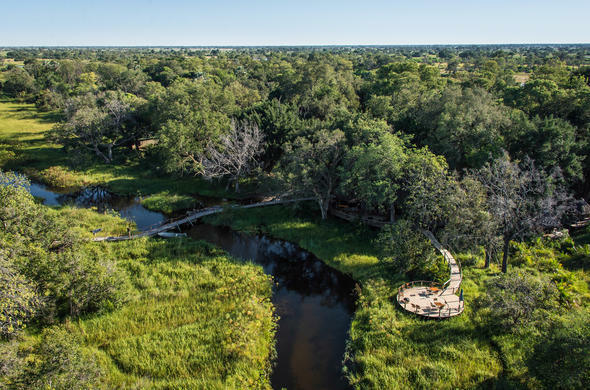 Built in one of the most beautiful corners of the Okavango, Xigera Camp is is situated on 'Paradise Island' within the Moremi Game Reserve. Xigera Camp is located in an area that is surrounded by permanent water in the heart of the Okavango Delta, Botswana, on Paradise Island, within the Moremi Game Reserve. The new Xigera opened in May 2000 consists of 10 luxuriously furnished walk-in tented rooms, with en-suite facilities, built within a shady forest. There are no other camps in the area, your neighbours are the wild animals which you will encounter during your game drives, walking safaris or mokoro trips. Xigera is one of the Okavango's best-kept secrets. The Botswana safari camp has been in existence since the mid 1980's. Xigera is in an area which has permanent water - yet there are lots of large islands in the area which hold good concentrations of animals. Xigera Camp is the perfect land and water activity camp - in fact it is one of the only Okavango camps, which offers game drives, foot safaris, mokoro and boating trips. Xigera Camp is located in an area that is surrounded by permanent water in the heart of the Okavango Delta on Paradise Island, within the Moremi Game Reserve.